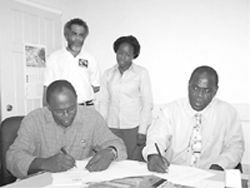 The SVGSIF will oversee the implementation of the project, which is being funded from the STABEX 1996/97 funds, totaling EC$ 1.6 million. The project will be implemented over the next three years by The National Fair Trade Organisation who will report directly to the St. Vincent and the Grenadines Social Investment Fund. The project will seek to promote a more sustainable and economically viable agriculture production system while reducing the negative impact of conventional farming on the environment. Another objective is the expansion of economic alternative for farmers while developing an environmentally friendly production system in bananas.